DRAW PREVIEW: All pairings of the last elimination round before the group phase will be determined on Tuesday in Vienna. The draw will be streamed live on Facebook and youtube. Following the last weekend's matches all 24 teams for the Women's EHF Cup Qualification Round 3 have been confirmed. While the reigning winners of the Women's EHF Cup Rostov-Don are playing in the EHF Champions League this season, eight former trophy holders made it through to the last qualification round before the group phase. While DVSC-TVP, Zvezda Zvenigorod, Randers HK and DKKA Dunaujvaros KA raised the EHF Cup in the old format, Koebenhavn Haandbold and ES Besancon Feminin triumphed in the Cup Winners' Cup before both competitions merged together prior to the 2016/17 season. Viborg HK and Handball Club Lada succeded in both the EHF Cup and Cup Winners' Cup in the past. Six countries have more than one club in the starting grid of the qualification round 3 with Hungary and Russia sharing a joint lead with four clubs each, followed by Denmark with three teams and Belarus, France and Romania with two sides each. The teams from the same country can face each other in the qualification round 3. The draw will take place on Tuesday 24 October at 11:00 hrs local time at the EHF Office in Vienna. 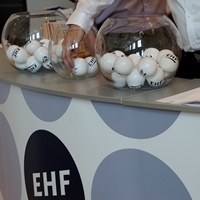 All fans will be able to follow the streaming of the draw on the EHF Facebook page and on youtube.com/ehfTV. The first leg of the qualification round 3 takes place on 11/12 November, the second leg will follow one week later. The 12 winners qualify for the group phase, where they join four bottom ranked teams of the Women's EHF Champions League Group Matches.